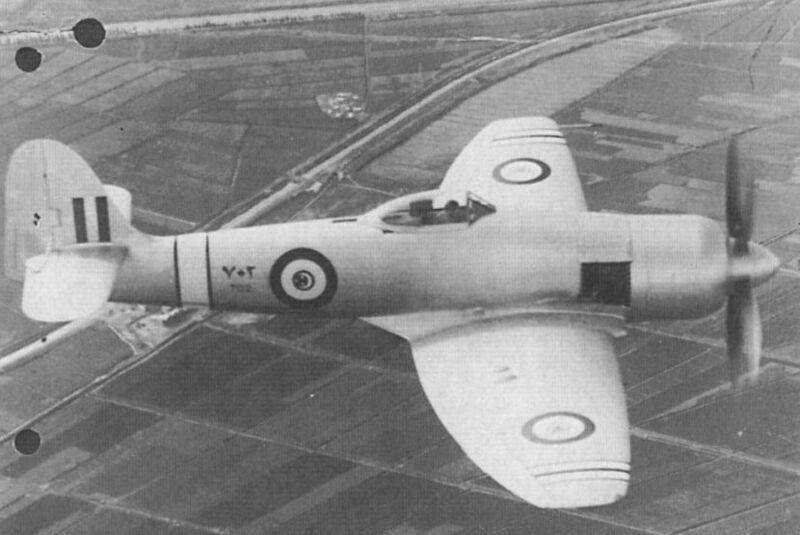 The first prototype Hawker F.2/43, NX798, was powered by a Bristol Centaurus XII radial engine. It made its first flight at Langley on September I, 1944. 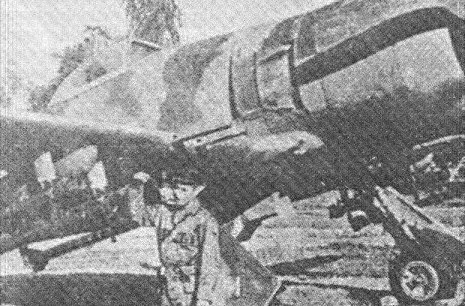 The aircraft was later registered G-AKRY, and was subsequently sold to Egypt. Первым прототипом Fury с мотором Centaurus стал борт NX798 (фото); позднее мотор заменили на Centaurus XVIII (с пятилопастным винтом) и продали машину Египту. Британские ВВС заказали 200 Fury перед самым окончанием Второй мировой войны. Этот заказ аннулировали в 1945-м. На снимке - второй прототип. Видно, как высоко расположена кабина пилота. The Centaurus XV-powered Fury prototype, NX802, right, first flew on July 25, 1945. It was sold to Pakistan in 1949. За первым Fury последовал борт LA610 (фото) с двигателем Rolls-Royce Griffon 85 и шестилопастными соосными винтами встречного вращения. The aircraft is seen in its earlier guise, fitted with a Griffon 85 and Rotol six-bladed contra-rotating propeller. 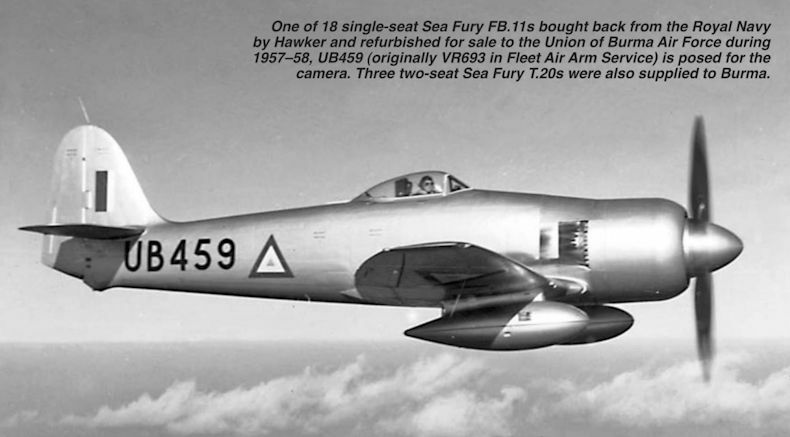 The second prototype Fury, LA610, began life with a Roll-Royce Griffon 85 engine. It is seen being re-engined with a Napier Sabre VII in 1946. 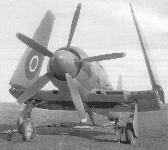 The second prototype Fury after installation of the Napier Sabre, which drove a four-bladed propeller. С мотором Napier Sabre VII (фото) скорость достигла 781 км/ч. Самолет стал, вероятно, самым скоростным из построенных компанией "Hawker" летательных аппаратов с поршневыми двигателями. 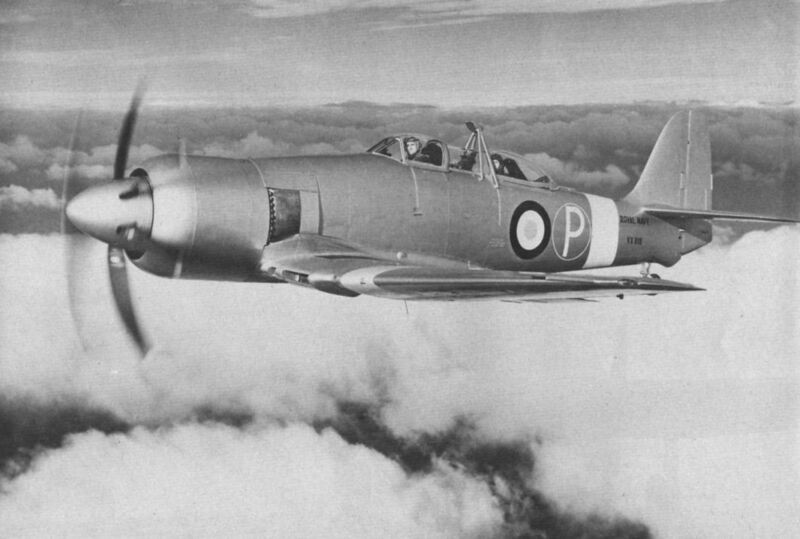 The first Sea Fury prototype, SR661 flew for the first time on February 21, 1945. 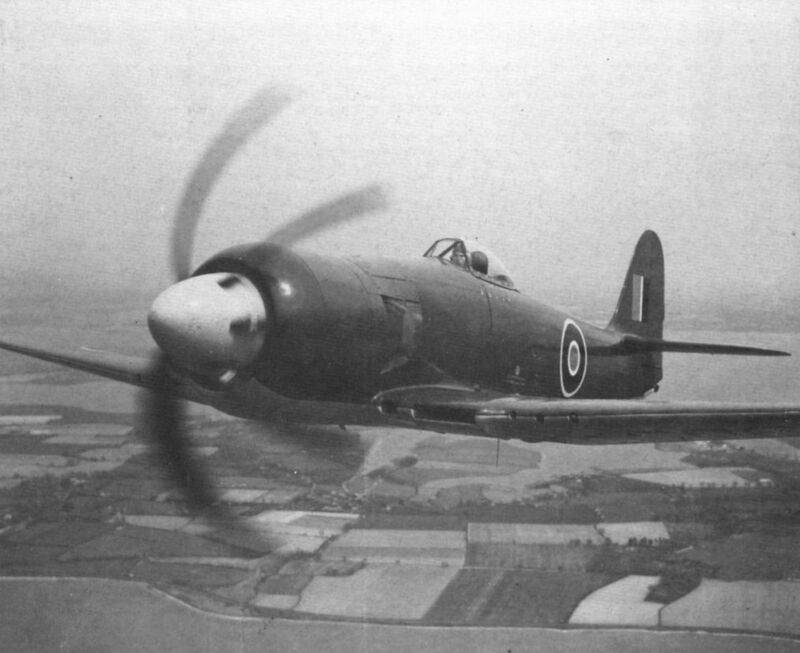 The second Sea Fury prototype, SR666, had a Centaurus XV engine and Rotol five-bladed propeller. 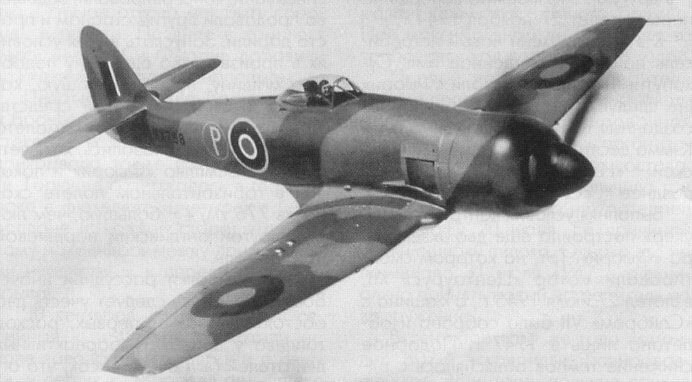 Демонстрация складывания крыла на втором опытном "Си Фьюри"
The Hawker Sea Fury Single-seat Naval Fighter (Bristol Centaurus XVIII engine). 21 февраля 1945г. : взлетел первый создававшийся специально для ВМС прототип истребителя Hawker Sea Fury (SR661) с двигателем Centaurus XII и четырехлопастным воздушным винтом Rotol. 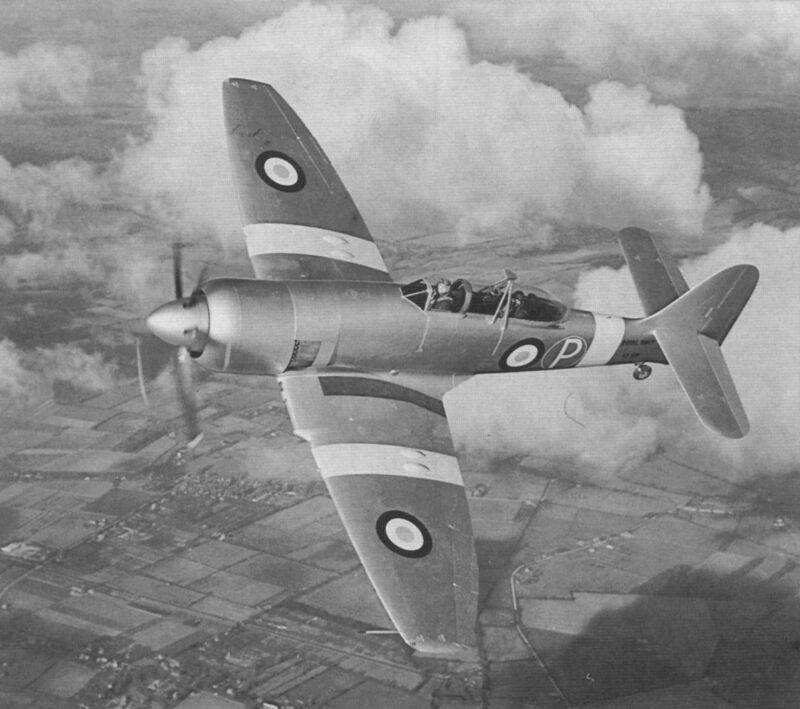 A little more than 18 months later the first production Sea Fury, TF895, seen before application of its Naval colour scheme, made its maiden flight. 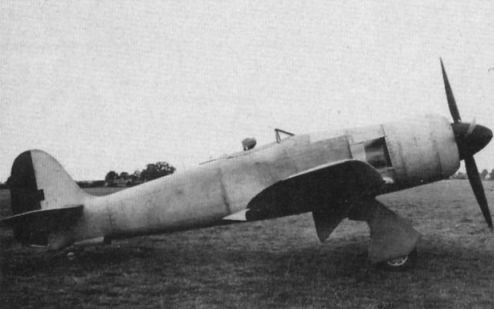 Another view of TF895, with wings folding. F Mk X TF906. Note the four-bladed propeller. 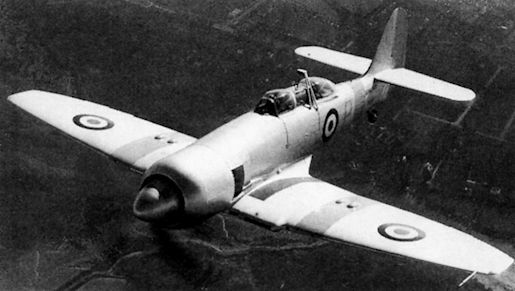 Первый "Си Фьюри" Mk.X, переделанный из "Облегченного истребителя"
Sea Fury F.Mk X TF905 served with No 778 Sqn FAA. 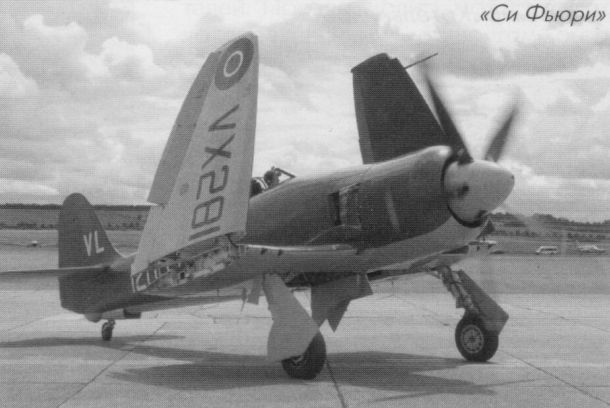 Hawker Sea Fury F.X TF905 from the first production batch. The aircraft is being flown by Hawker test pilot Bill Humble. 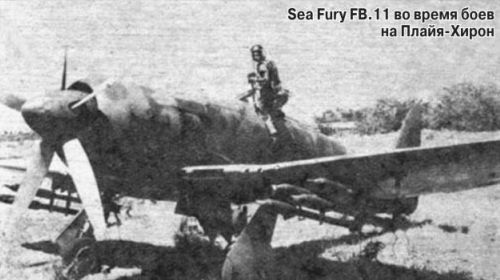 Another view of F.X TF952. 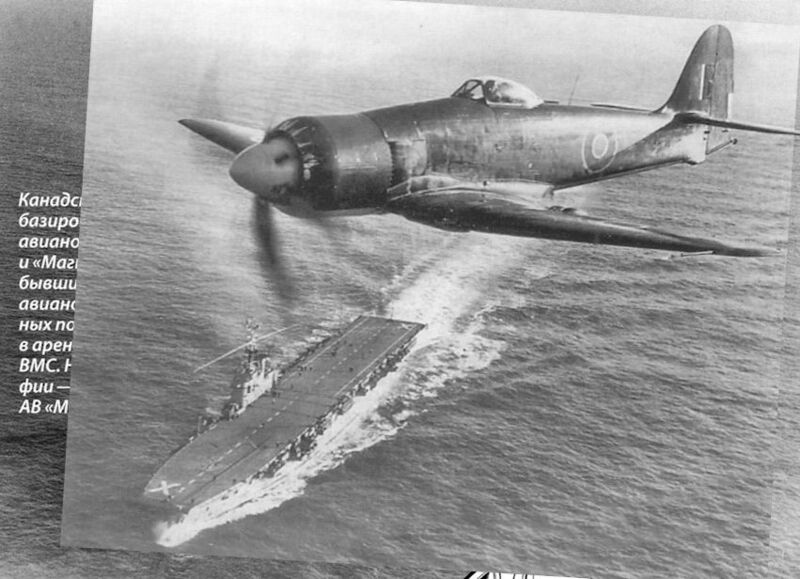 The Fleet Air Arm received its first F.Xs in February 1947. 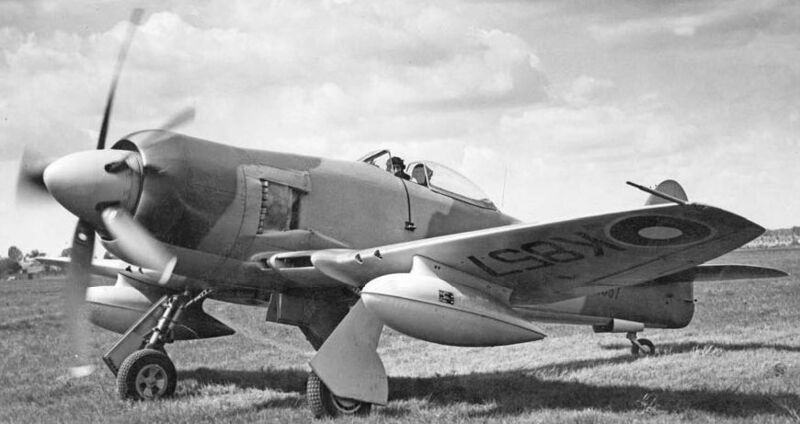 Sea Fury F.X TF952. The aircraft’s powerplant was an 18-cylinder Bristol Centaurus 18 radial, developing a maximum of 2,560 h.p. 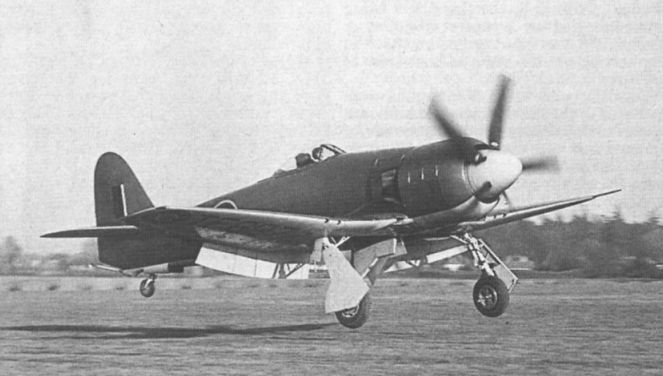 Sea Fury F.X TF901, from the first production batch, shows off its pugnacious profile. 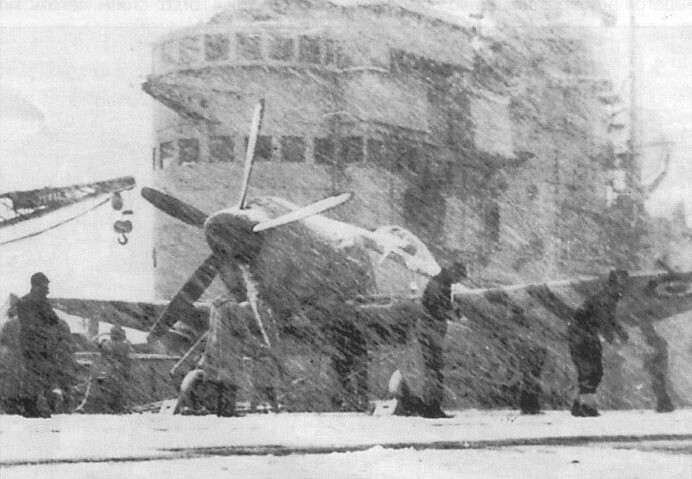 "Си Фьюри" Mk.X над авианосцем "Формидейбл"
An arresting shot of the fourth production Sea Fury F.X., TF898, aboard HMS Illustrious in 1947. 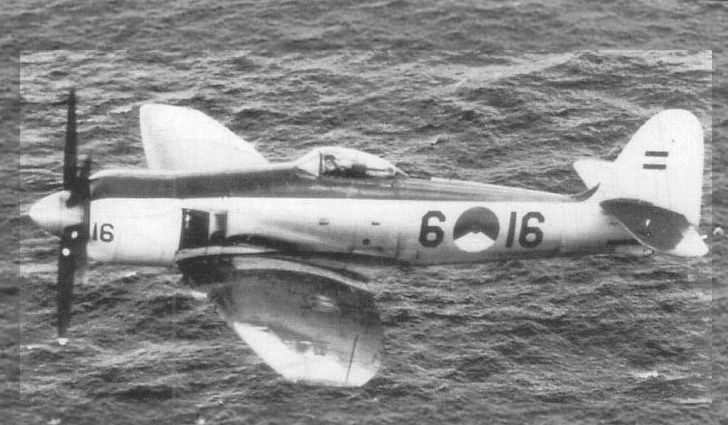 The third Sea Fury F.X, TF897. 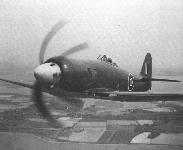 Sea Fury FB.11 TF988, photographed in November 1947. The FB.11 first entered first-line service in February 1948. Sea Fury FB.11 VR944 of No 806 Sqn FAA at RCNAS Dartmouth, Nova Scotia, Canada, on June 19, 1948. "Си Фьюри" FB.11 (WE 726). 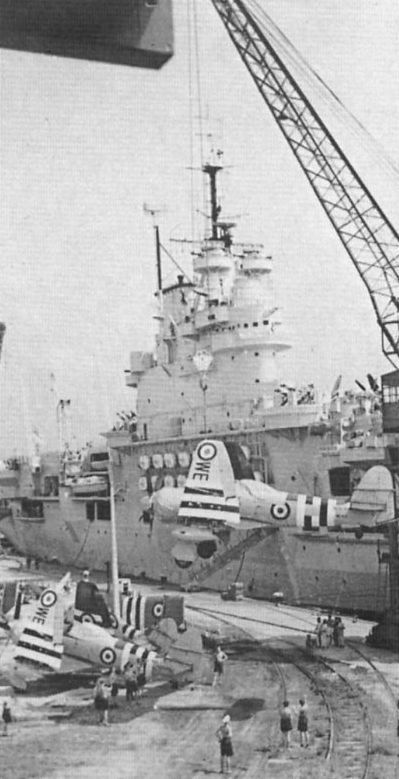 Spare 802 Sqn Furies being loaded aboard HMS Ocean in August 1952. 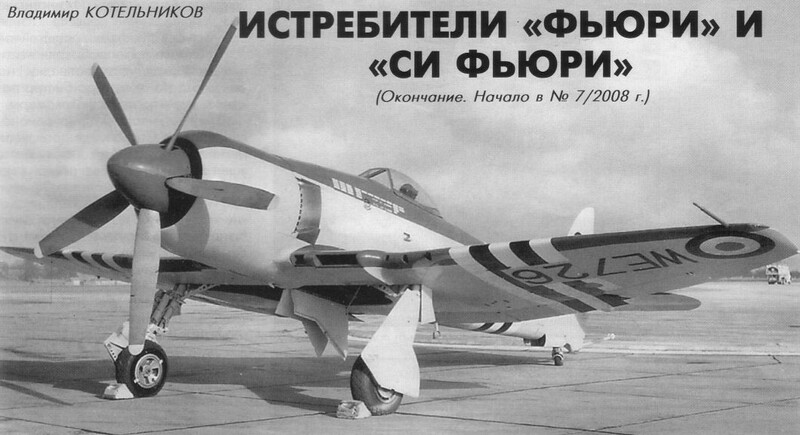 "Си Фьюри" на палубе авианосца "Тезеус"
Самолеты Sea Fury FB.Mk 11 авиации британского флота и ВМС Австралии участвовали в корейской войне. Самолет из 802-й эскадрильи сфотографирован на борту британского авианосца "Оушн" в 1952 году. 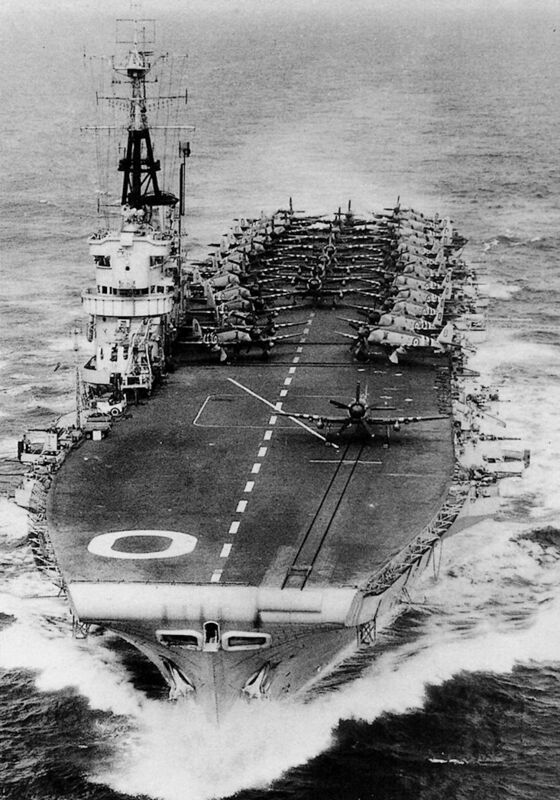 HMS Ocean off Korea in the Yellow Sea on July 25, 1952. 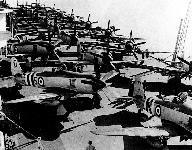 Aboard can be seen 802 Sqn Sea Furies and 825 Sqn Fireflies. Самолеты Sea Fury из 802-й эскадрильи и Firefly из 825-й эскадрильи на палубе авианосца "Оушн", следующего из Японии к берегам Кореи (июль 1952 года). Авианосец ходил к берегам Кореи дважды - в 1952 и 1953 годах. Несмотря на непогоду "Си Фьюри" готовится к вылету с авианосца "Сидней"
Hawker Sea Fury FB.11 VX653 photographed in 1963. В школе морских летчиков (NAFS, 736-я и 738-я эскадрильи) на базе Калдроуз совершенствовались пилоты Sea Fury авиации Королевского флота Великобритании (RNAS). Самолет FB.Mk 11 из состава школы готовится к взлету с палубы авианосца "Венженс", начало 1950-х годов. HMS Glory’s Sea Furies in action off the coast of Korea in June 1951. 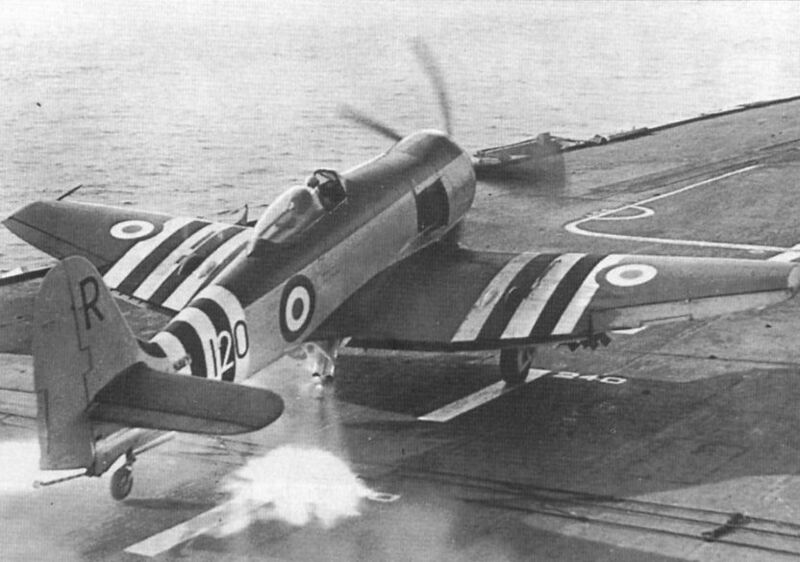 A Sea Fury makes a rocket-assisted take-off from the flight deck of HMS Glory in Korean waters. In 14 months more than 1,000 sorties were flown from this carrier. 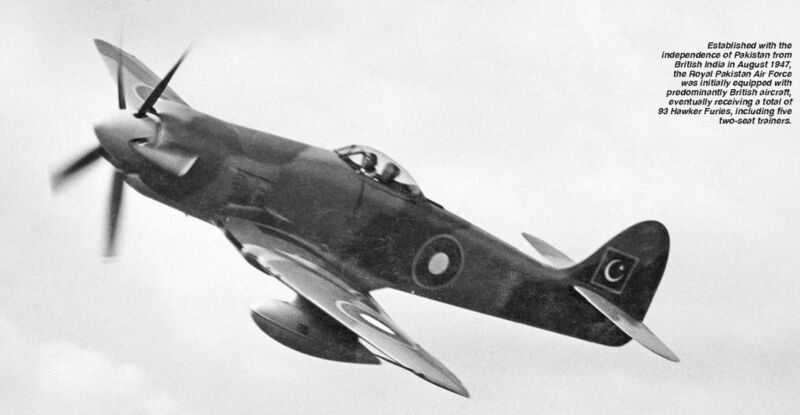 Lt Cdr Harrington just airborne during a flying display at the St Merryn open day in July 1950. 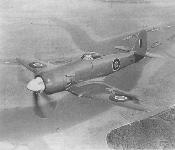 Sea Fury F.B.Mk 11 VW654 was attached to RNAS Anthom. Hawker Sea Fury F.B.11 WF619, later attached to RNAS Anthom. 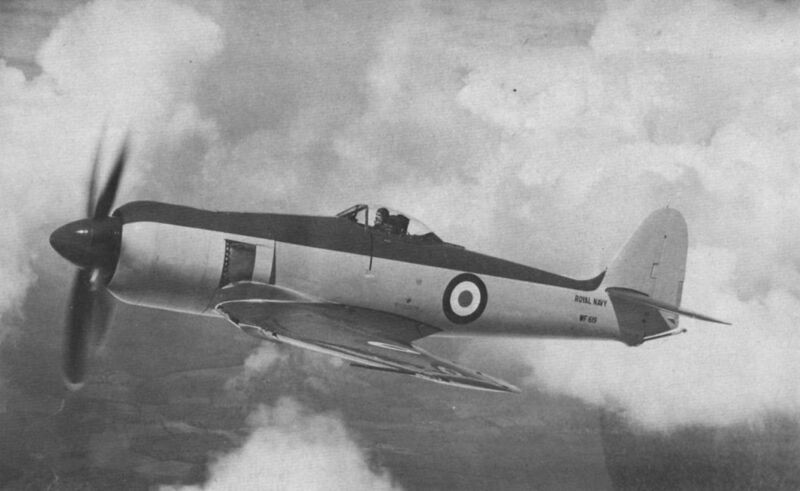 The Mk 11 was the FAA’s front line single-seat fighter until replaced by the Hawker Sea Hawk in 1953. 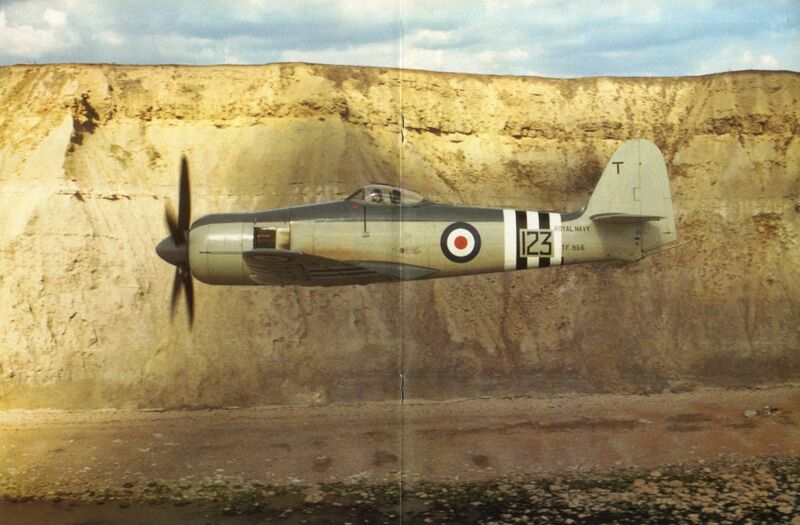 The Hawker Sea Fury FB Mk 11 TF956 are representative of Fleet Air Arm equipment in the early post-war years. Its marked with Korean war stripes, as this photo shows. Still going strong in the USA is Frank Sanders’ Sea Fury, a regular air race competitor. На снимке времен войны в Корее виден Sea Fury авиации британского флота, с подвешенными бомбами и ПТБ, который заходит в атаку на выявленную цель противника. 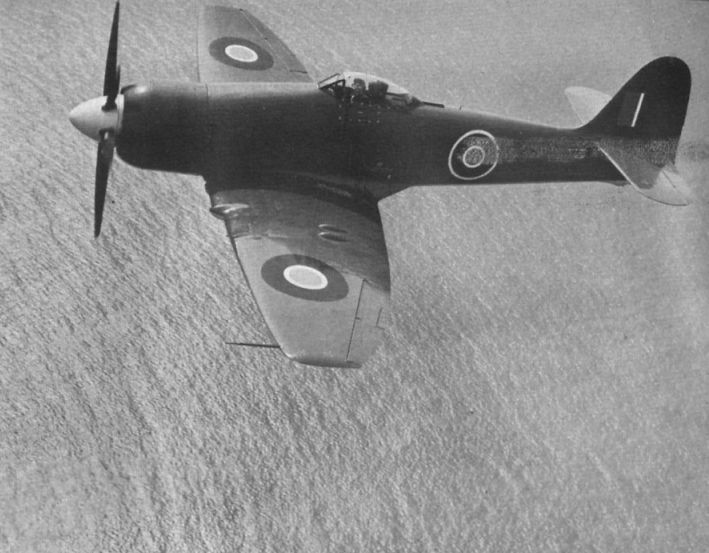 Британские Sea Fury и Firefly привлекались преимущественно для ударов по транспортным узлам или дорогам, как на фотографии. 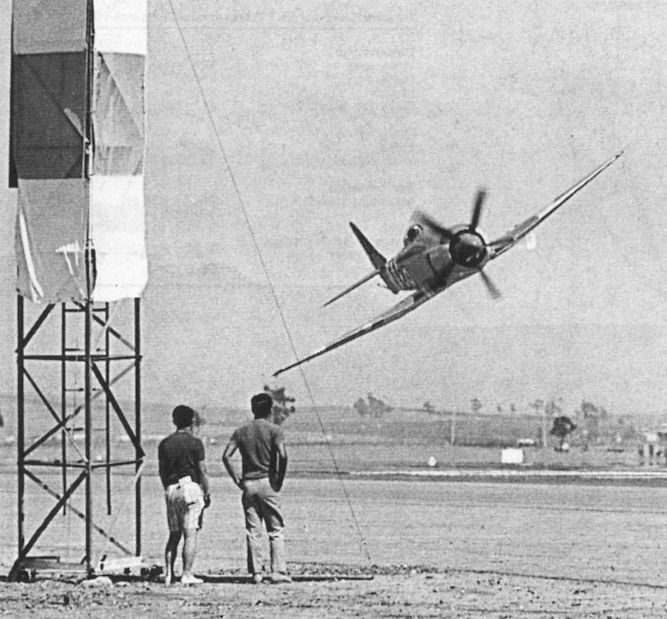 A Sea Fury demonstrates its destructive power. 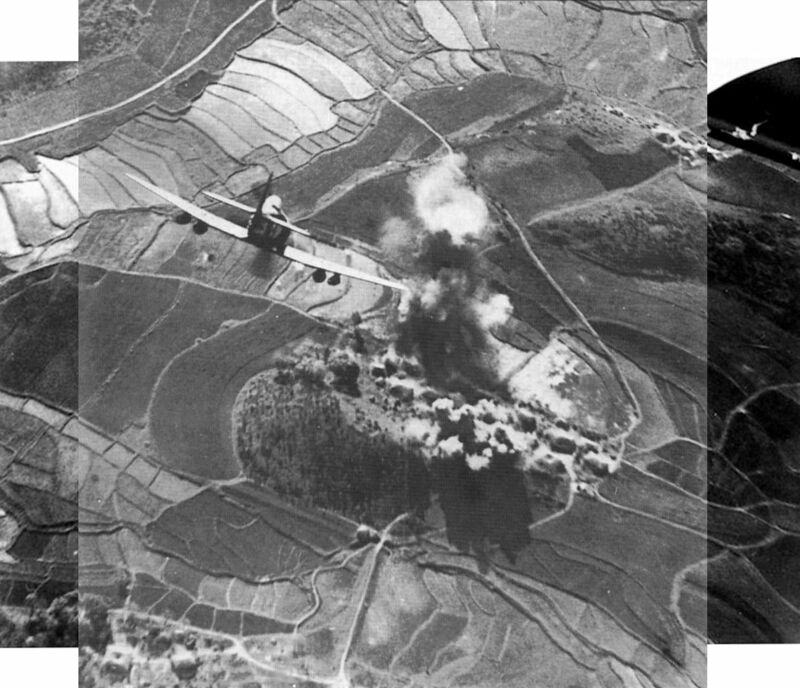 Normal armament was four fixed 20mm wing guns with provision for twelve 60 lb bombs, rocket projectiles or two 1,000 bombs below the wings. A Sea Fury firing a dozen 3in rockets with 60 lb warheads over the Triligga ranges, Cornwall, in 1951. 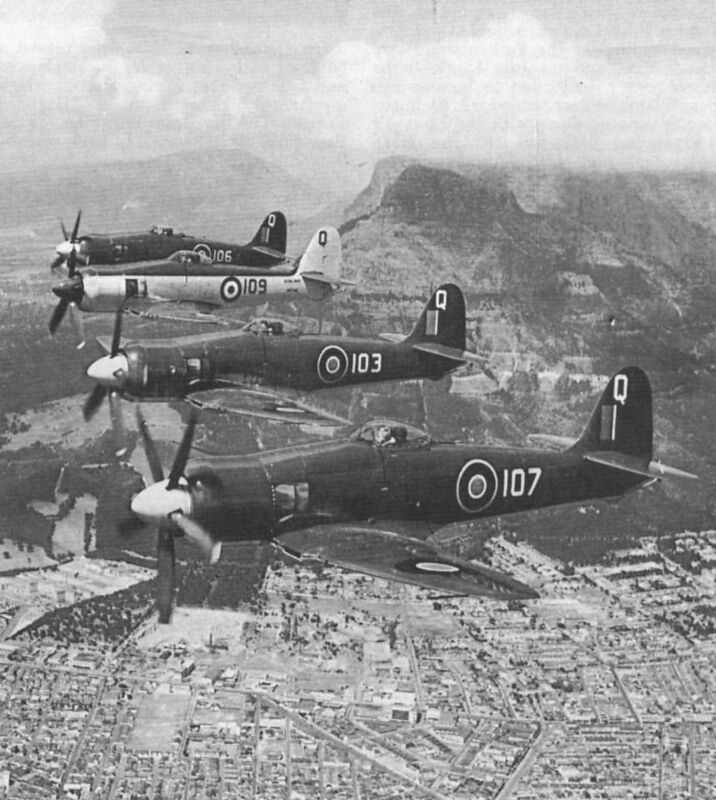 Four Sea Furies over Cape Town, South Africa in 1949. 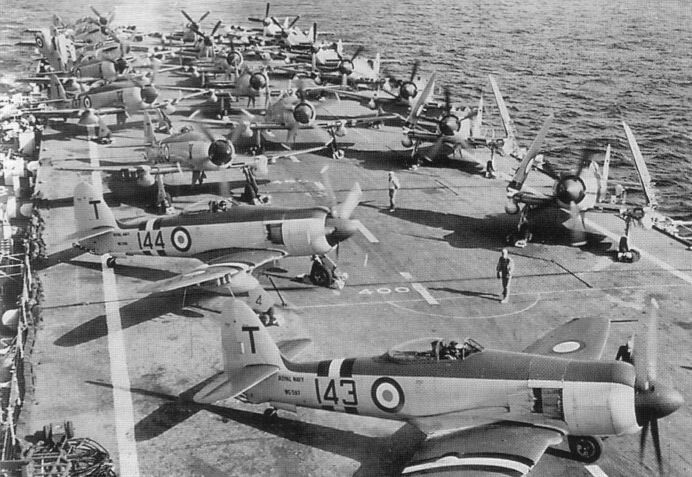 These 802 Squadron FB.11s embarked on HMS Vengeance in August 1948 for service in Home waters and the Atlantic. 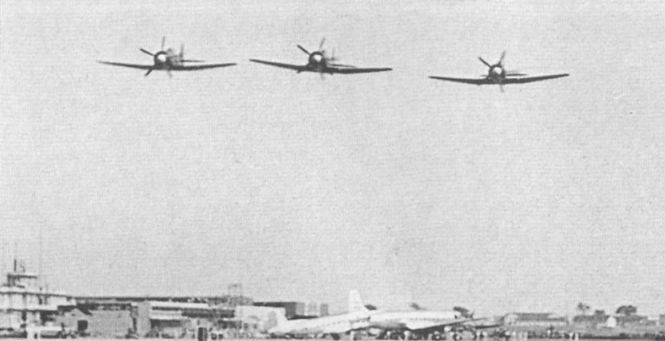 Three Sea Furies in formation over Avro Canada’s factory at Malton, Ontario, during 806 Sqn’s North American tour in 1948. 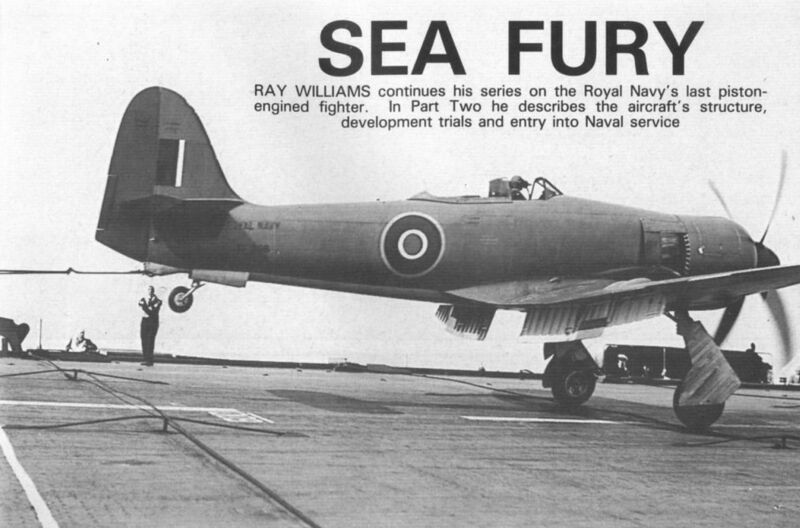 Sea Fury F.B. 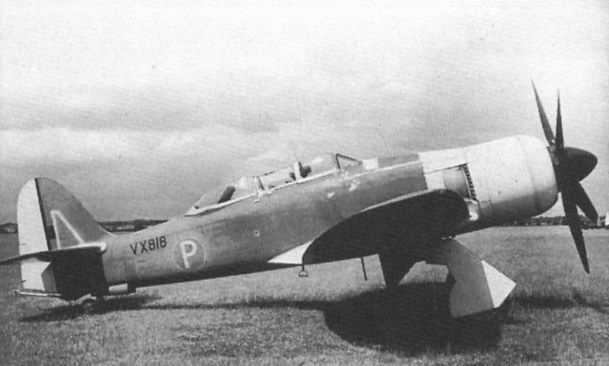 Mk 11 TF969 was attached to No. 8 Training Unit, and was re-purchased by Hawker Aviation from RNAS Abbotsinch in 1957-58. 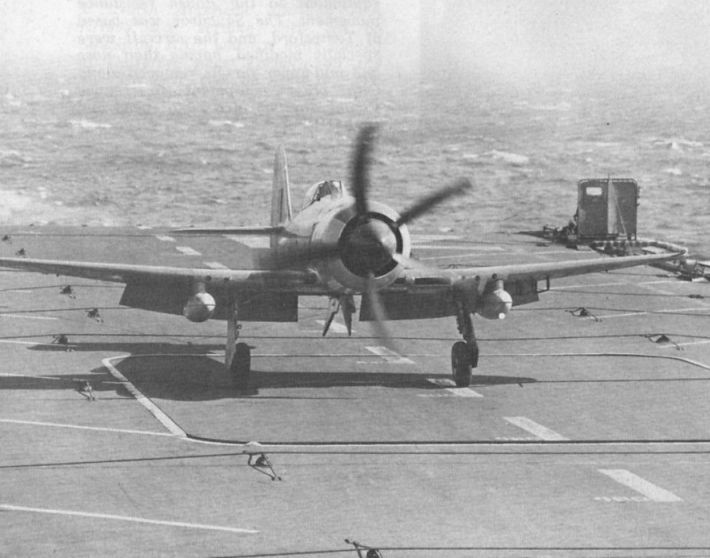 Sea Fury F.B.Mk 11 TG120 was delivered to the Royal Canadian Navy in 1948, and is seen landing on HMCS Magnificent, an 18,000 ton light fleet carrier, during deck landing trials in 1948. This aircraft was subsequently lost in a ditching on June 12, 1951, while serving with VF870 Sqn. 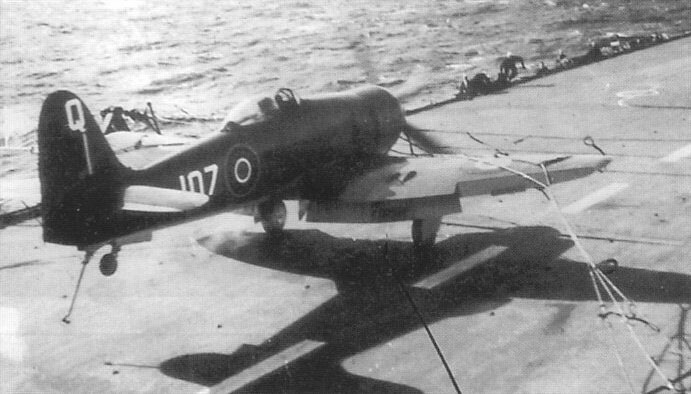 A Royal Canadian Sea Fury landing on HMCS Magnificent. 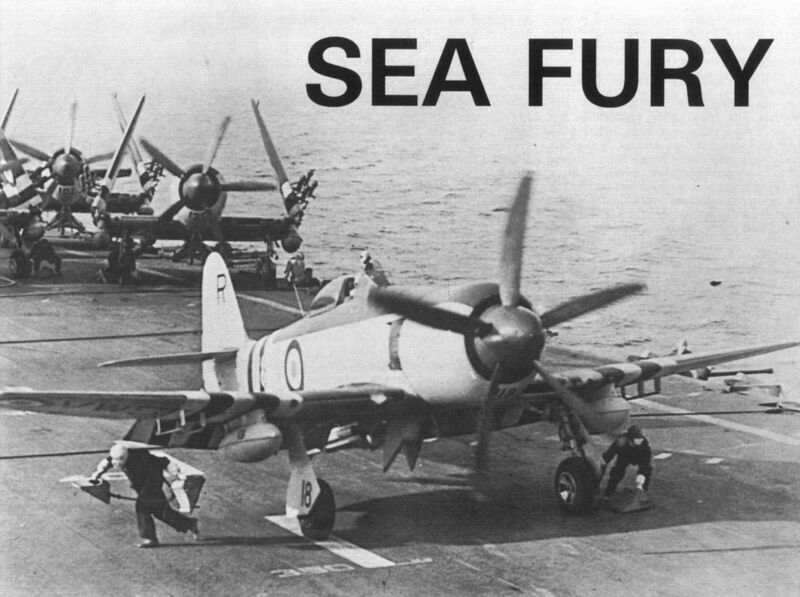 Many ex-FAA Sea Furies were transferred to the RCN. 9 августа 1952 года лейтенант Питер Кармайкл (второй справа) стал единственным британским пилотом, одержавшим победу в небе над Кореей на самолете английского производства. 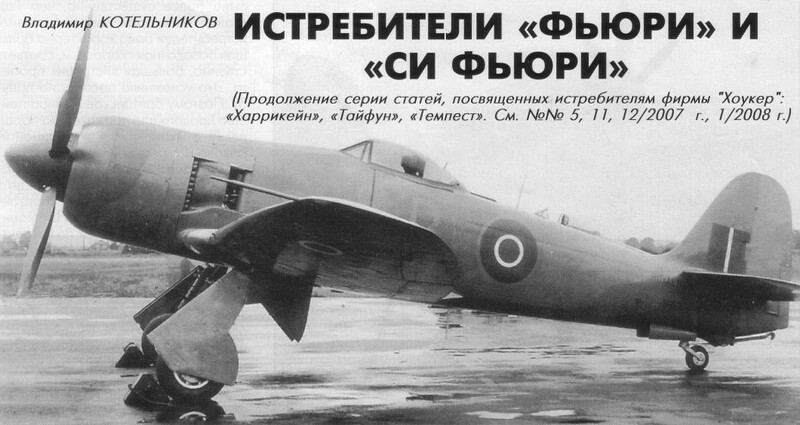 На этом поршневом истребителе Sea Fury он сумел сбить МиГ-15. 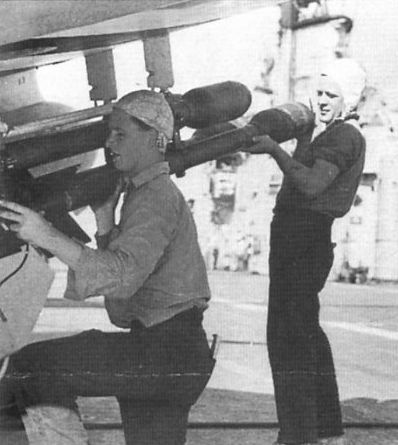 Two RAAF naval airmen arming a RAAF Sea Fury aboard the aircraft carrier Sydney in Korean waters. 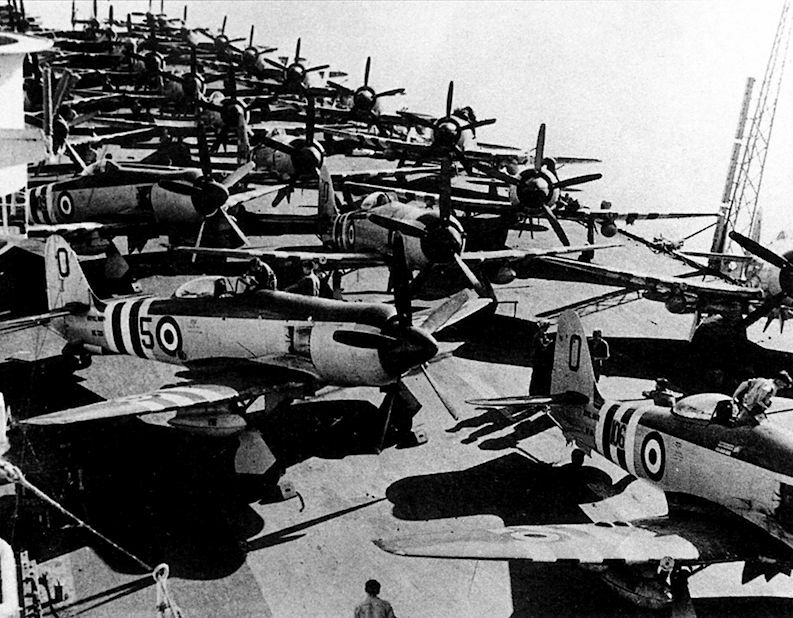 Sea Fury FB.11s in storage at Langley after repurchase by Hawker. 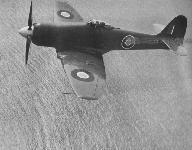 The MLD was the first export customer for the Sea Fury, ordering 22 Mk.50s from Hawker and producing them under license. 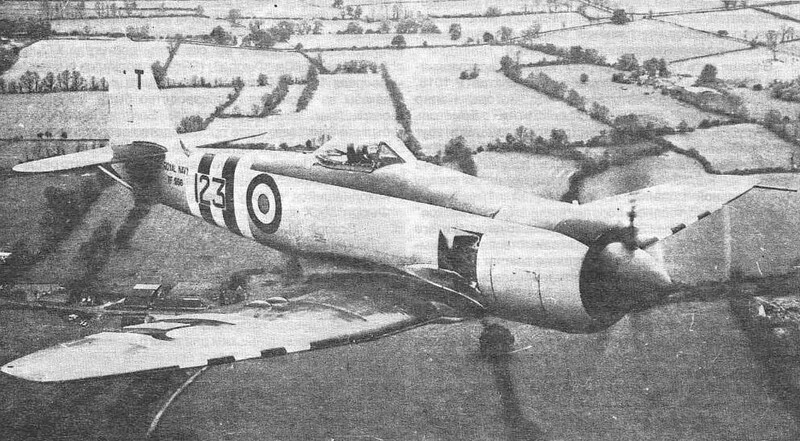 Голландский "Си Фьюри" FB.50, выпущенный по лицензии на "Фоккере"
Sea Fury поступили на вооружение ВМС и ВВС шести зарубежных стран. Первую партию из десяти самолетов варианта Mk 50 в октябре 1946 года заказали Нидерланды (фото), до 1948 года они базировались на АВ "Наирана". Затем с 1950 года были поставлены еще 12 самолетов, и 26 машин по лицензии выпустила компания "Fokker". Самолеты входили и в состав авиагруппы АВ "Карел Дорман" (бывший британский "Венерэйбл"), полученного в 1948 году и проданного Аргентине в 1969 году. 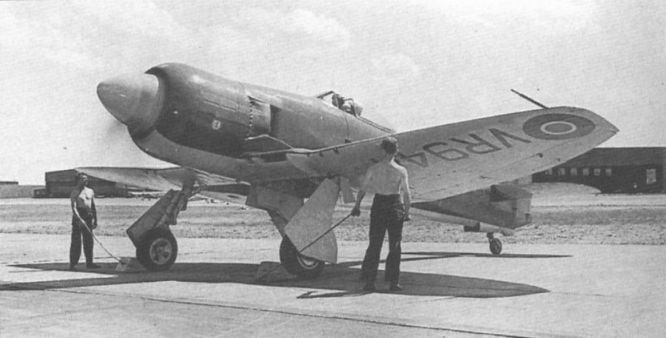 The Royal Netherlands Navy took delivery of 22 Sea Fury FB.50s. 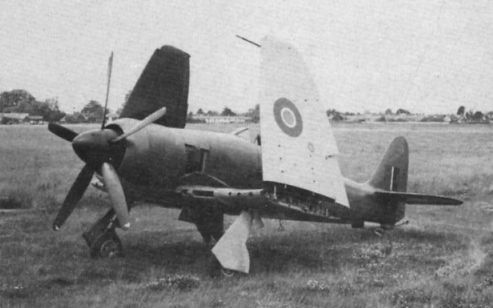 A further 25 Furies were licence-built in Holland. 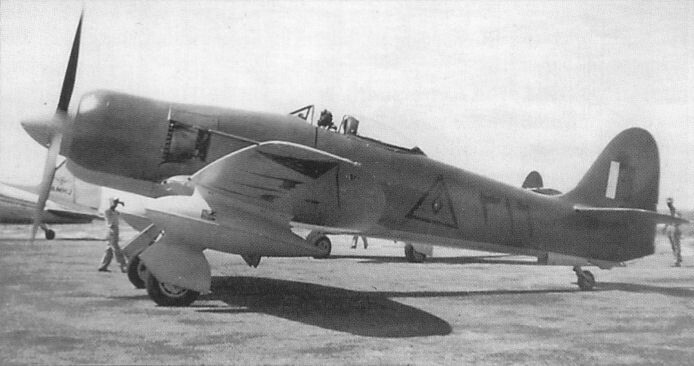 Iraqi Air Force Hawker Sea Fury FB.60 312, one of many Sea Furies supplied to that country. Египет получил в 1950-1951 годах 12 самолетов (на фотографии - один из таких самолетов перед поставкой), два из них дослужили до Суэцкого кризиса 1956 года. Два самолета варианта ISS были переданы Ираком. 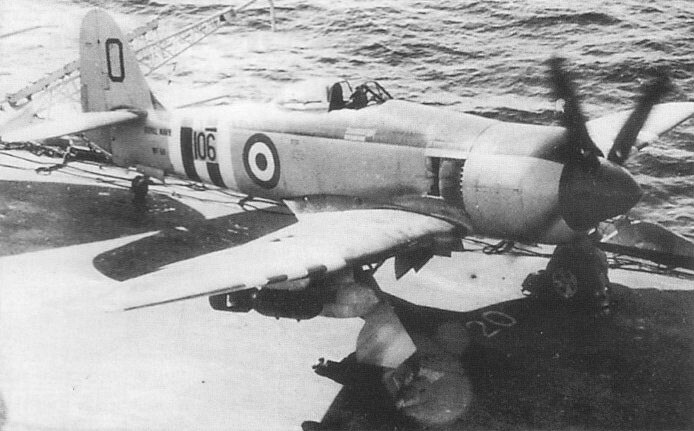 One of the 12 Sea Furies delivered to Egypt in 1950-51, this particular aircraft having been used in an attempt to establish a new London-Cairo record in February 1950. 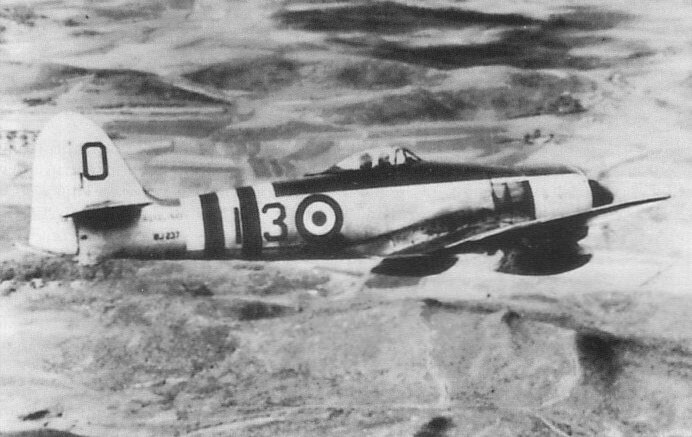 One of 12 Sea Fury FB.11s ordered by the Egyptian Air Force in 1949. 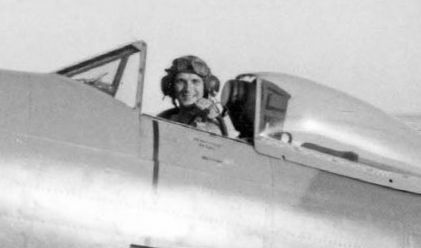 Hawker test pilot Neville Duke taxies out at Langley in Fury FB.60 K857 on May 12, 1949, shortly before taking off for London Airport (Heathrow), where he was to begin his record-setting flight to Karachi via Rome. 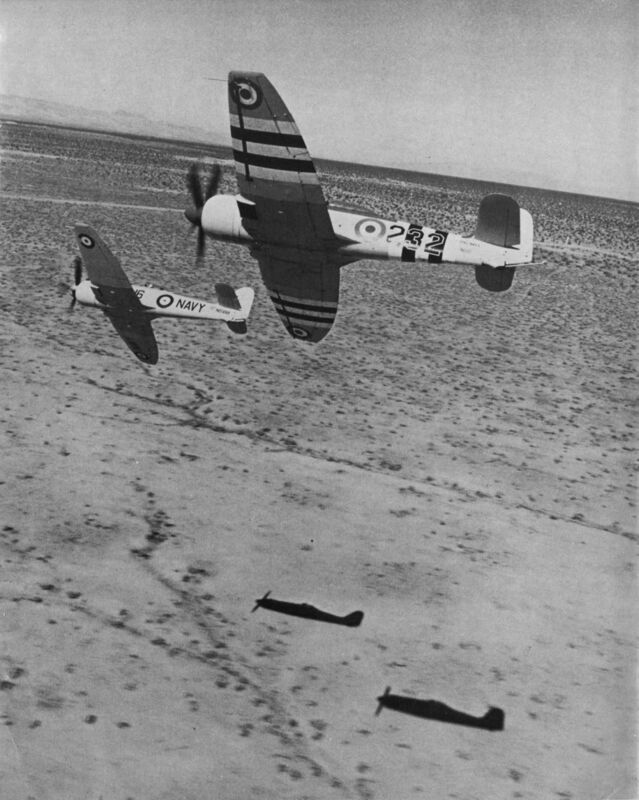 Duke set new records to both points, reaching Rome in 2hr 31min and Karachi in 15hr 24min, giving an average speed of 256 m.p.h. 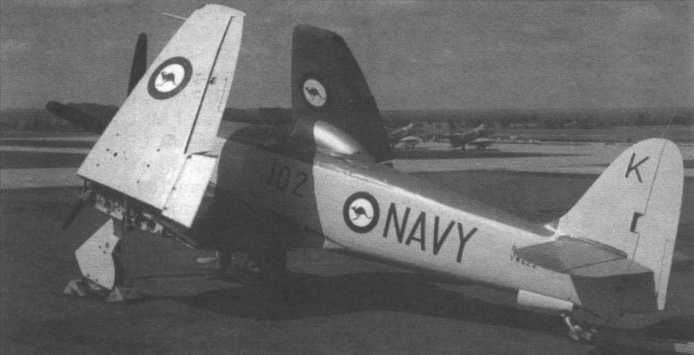 Pakistan took delivery of 98 Sea Furies; FB.60 L982, photographed in 1954, was one of them. 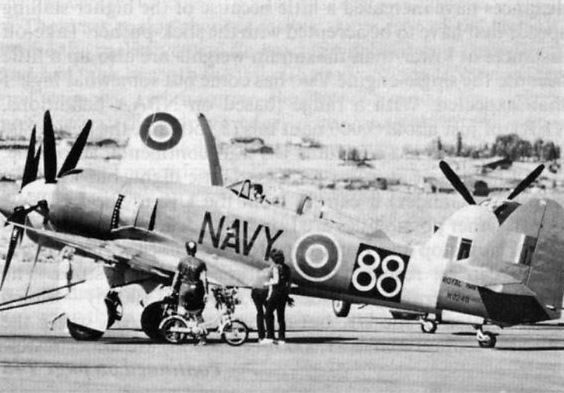 Fury FB.60 L935 on the flight test line at Langley before its delivery to Pakistan, in company with unpainted Sea Fury VX691, which went on to serve with the Fleet Air Arm’s 807 Sqn in the Korean conflict. 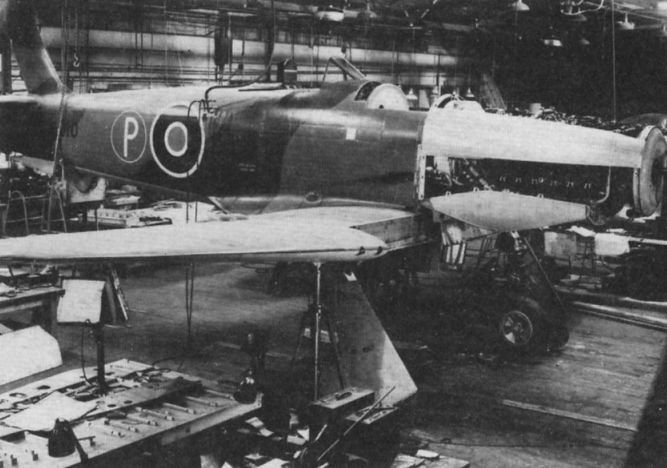 By the time the Furies had reached Sharjah, their factory finish was somewhat the worse for wear, despite the group being given specific orders to deliver the aircraft in pristine condition. 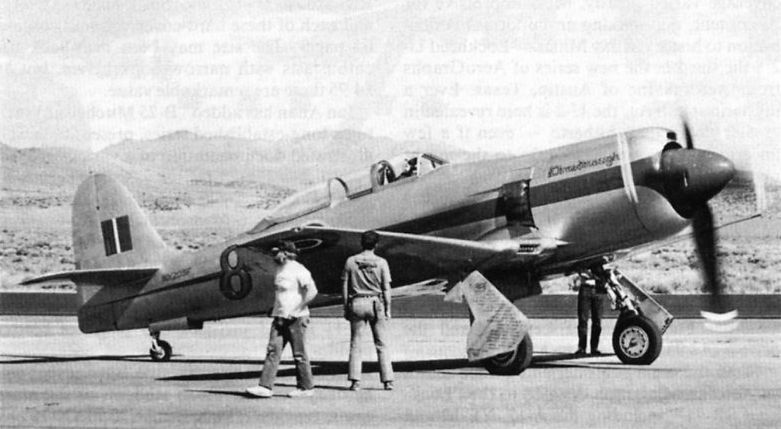 A line-up of Royal Pakistan Air Force (RPAF) Hawker Fury FB.60s at an RPAF base in the North-West Frontier Province (now the Khyber Pakhtunkhwa Province) in the early 1950s. Пакистан разместил самый крупный зарубежный заказ на Sea Fury - 98 самолетов FB.Mk 60 поставлены в 1949-1954 годах, включая пять FB.Mk 11, переданных из авиации британских ВМС, и пять спарок. Выше приведен фотоснимок варианта Mk 60 из 9-й эскадрильи, но самолеты также состояли на вооружении 5-й и 14-й эскадрилий, они активно применялись в Афганистане. Большинство к 1955 году были заменены на F-86 Sabre, хотя часть машин в качестве буксировщиков мишеней служила до 1963 года. 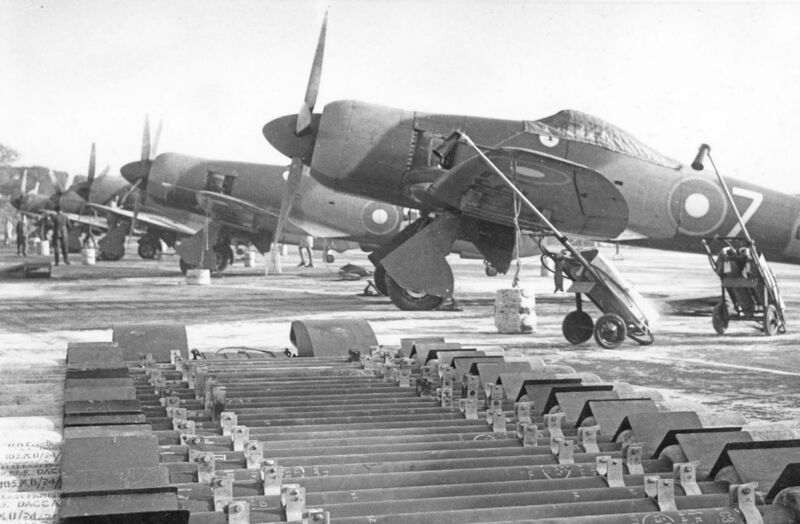 Furies of the RPAF’s No 9 Sqn being readied for a sortie with wing-mounted rocket projectiles. 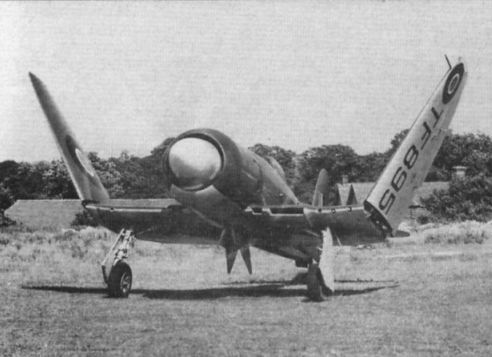 The type was the last of the RPAF’s piston fighters, the Service entering the jet age with the introduction of the Supermarine Attacker in 1951. 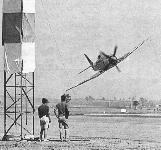 The Furies were phased out of Pakistani service with the arrival of the F-86 Sabre from 1957. Brooks’s machine, L904, at Nice, where the Fury delivery team stayed overnight. 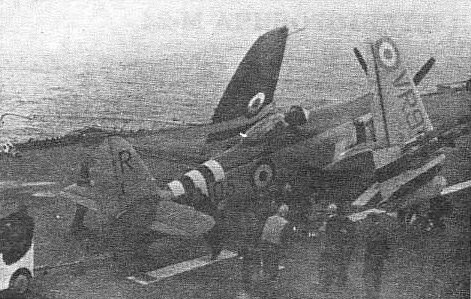 Although the aircraft had developed a fault with one of its air intakes, it was decided to press on with it as it was until arrival on Malta . . . 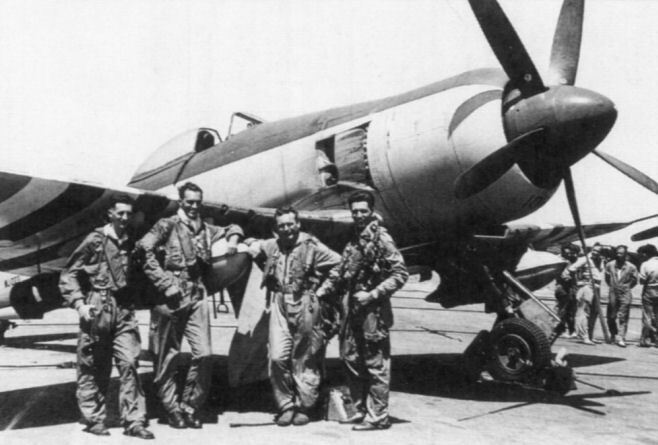 Standing beside Brooks’s Fury at Bahrain are fellow pilots Jimmy Hall (furthest left) and Johnny Johnson (beside droptank). 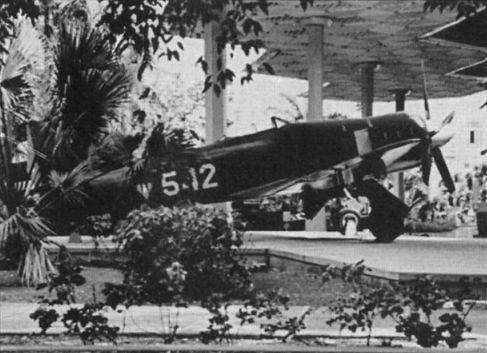 On landing at Bahrain one of the other pilots told Brooks that his engine had momentarily cut just after taking off from Baghdad - a foretaste of Brooks’s own later troubles. 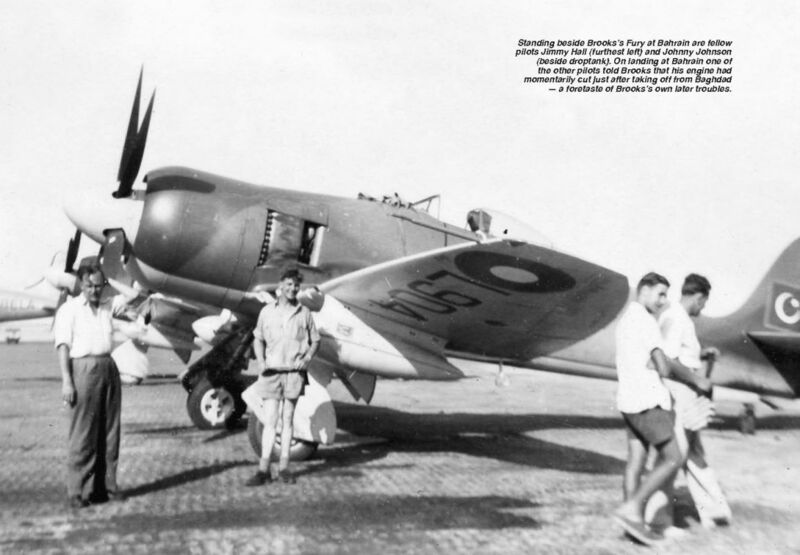 Established with the independence of Pakistan from British India in August 1947, the Royal Pakistan Air Force was initially equipped with predominantly British aircraft, eventually receiving a total of 93 Hawker Furies, including five two-seat trainers. 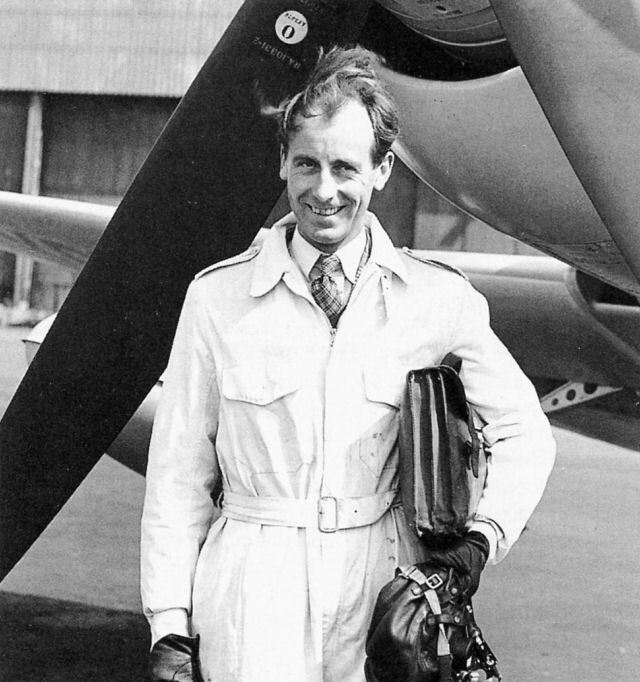 Johnny Johnson prepares for the final leg of the flight, from Sharjah to Karachi. 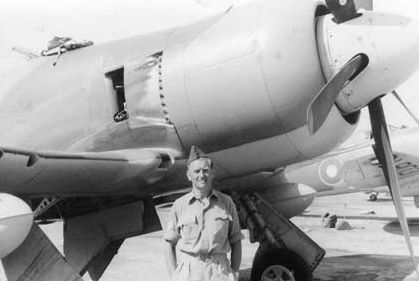 Brooks photographed the RAF fitter who fixed the filter shutter into the ram-air position. 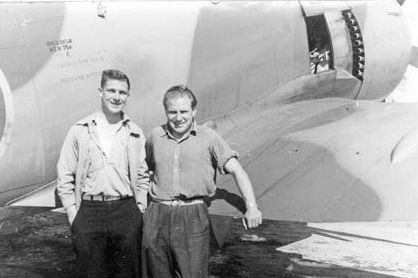 Two of Brooks’s fellow Fury delivery pilots at Luqa: Johnny Johnson (left) and Paddy Norton. Австралия получила британский АВ "Террибл" в конце 1948 года, после чего корабль получил имя "Сидней". 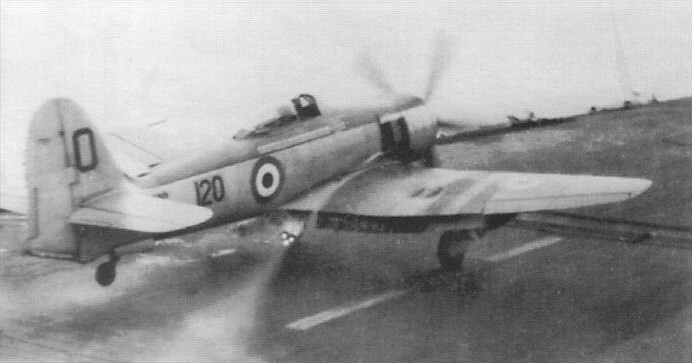 К нему была приписана 20-я корабельная авиагруппа - самолеты Fairey Firefly и Sea Fury FB.Mk 11 из 805-й аэ. "Сидней" вышел к берегам Австралии в 1949 году, но в 1950 году вернулся в Великобританию и принял на борт 21-ю корабельную авиагруппу, имевшую те же типы машин (Sea Fury из 808-й аэ). Австралийцы получили около 100 самолетов Sea Fury, которые поступили также в 850-ю аэ и ряд других подразделений. На верхнем снимке - самолет, приписанный к авиабазе Ноура и окрашенный в цвет "синий ВМС Австралии" ("RAN Blue"). Hawker Sea Fury VH- HFX/WE729 at RAAF Base Fairbairn, Canberra, Australia on March 17, 1986. Owned by Bruce Andrews, this ex-Iraqi aircraft was recently restored by Guido Zuccoli. 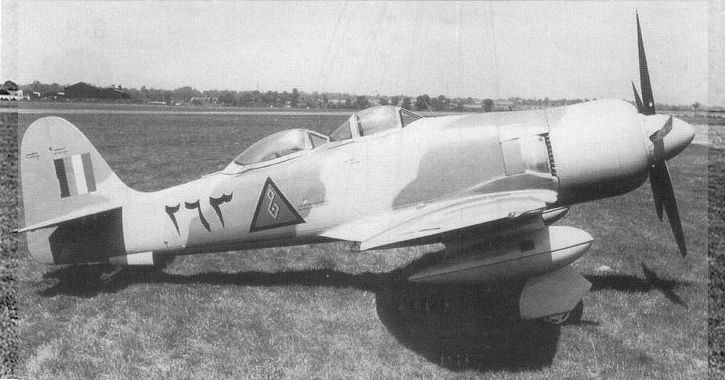 It wears the overall blue colour scheme of Fury WH589 “775”, which flew with the RANFAA aerobatic team in the Sixties. Photographed at last year's Reno Air Races by Chuck Aro, the P-51A illustrated here is a welcome addition to the ranks of airworthy Mustangs. 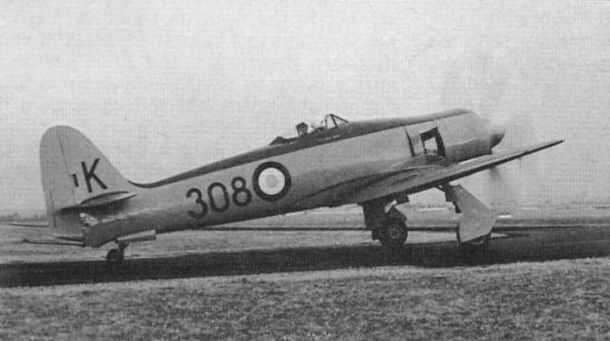 It carried "91" for the qualification flights and was then re-numbered "1” for the actual races, as seen as it taxies out behind Lloyd Hamilton's Hawker Sea Fury. 803-я и 883-я эскадрильи авиации британских ВМС были расформированы в 1946 и 1948 годах, соответственно, а затем были воссозданы в составе авиации ВМС Канады. Получив самолеты Sea Fury, они были переименованы в 870-ю и 871-ю эскадрильи. Канадские ВМС, как и австралийцы, получили Sea Fury, снятые после войны с вооружения британских ВМС. Всего было получено около 40 самолетов. Канадский флот также получил два легких авианосца - "Уорриор" (с самолетами Firefly и Sea Fury Mk 11 из 803-й аэ) и "Магнифисент" (с Sea Fury из 883-й аэ). В 1951 году эскадрильи получили новые номера - 870-я и 871 -я. 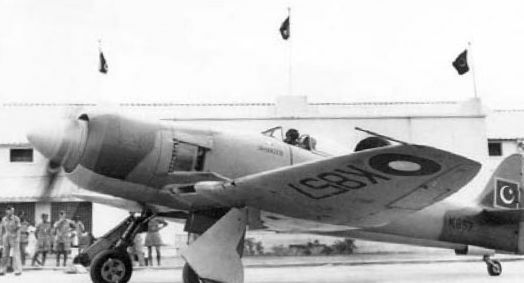 One of 18 single-seat Sea Fury FB.11s bought back from the Royal Navy by Hawker and refurbished for sale to the Union of Burma Air Force during 1957-58, UB459 (originally VR693 in Fleet Air Arm Service) is posed for the camera. 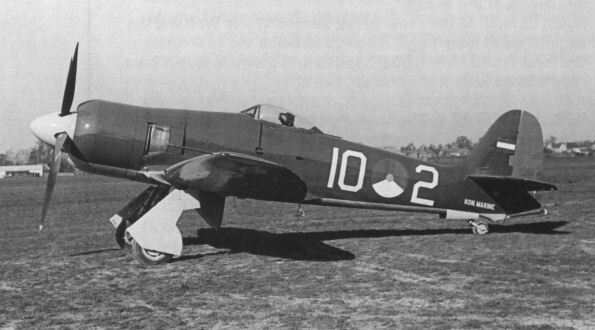 Three two-seat Sea Fury T.20s were also supplied to Burma. Кубинский летчик у "Си Фьюри" перед боевым вылетом. 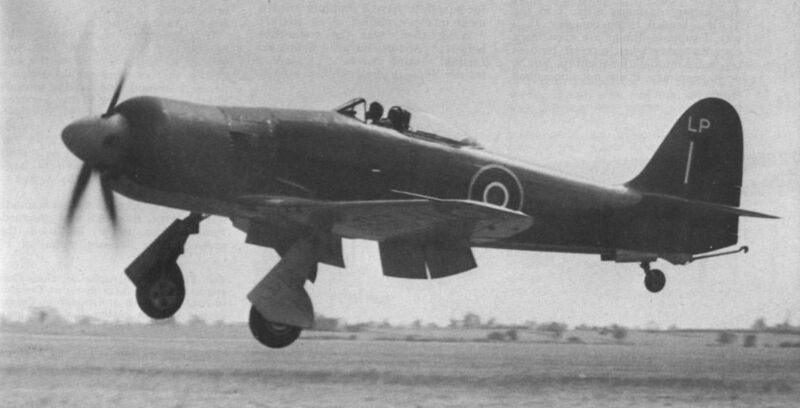 A newcomer to the US racing scene in 1971 was the Canadian-registered (CF-CHB) Sea Fury of Flt Lt Ormond Haydon-Baillie, finished in authentic RN colours as WH589. Among the several veteran aircraft preserved at Bankstown Airport, Sydney, is this fine specimen of the Hawker Sea Fury FB Mk 11. Originally WH588, it was operational in Korea and is now owned by Arnold Glass, carrying the registration VH-BOU. 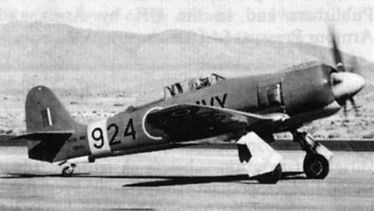 One of unmodified Sea Furies at Reno was Frank Sanders' T Mk 20 N924G. The Sea Fury T Mk 20 N924G, flown by Dennis Sanders. Гоночный "Си Фьюри" - "Критическая масса"
Powered by an R-4360 Double Cyclone, Lloyd Hamilton's single-seat Sea Fury, the “Havnaught". 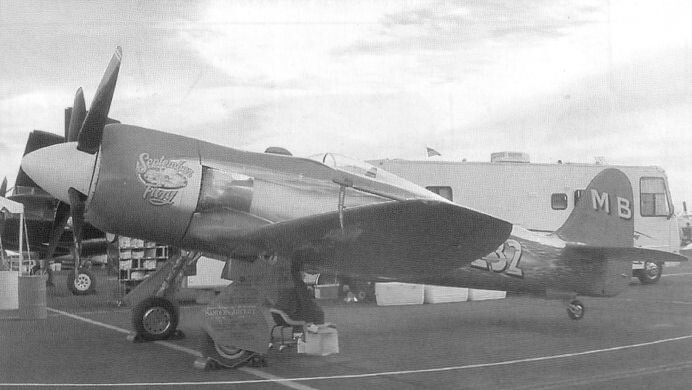 The "Dreadnought", a re-engined Sea Fury T Mk 20 in which Neil Anderson won the Unlimited Class Championship at Reno in 1983. Гоночный "Си Фьюри" - "Дредноут"
Baghdad Fury Trainer IDT 1. Fury с номером "263" - один из пары поставленных в Ирак в 1949 году учебных самолетов первой версии. Это самые первые двухместные Fury. За ними последовали 60 доработанных Sea Fury T.Mk 20 для британского флота. 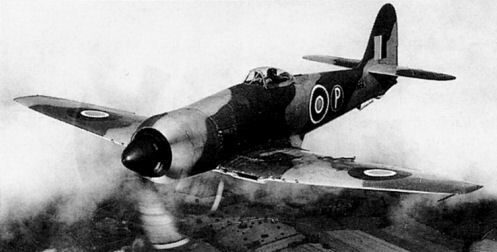 Двухместный учебный Sea Fury изначально создавался для Ирака, но были поставлены лишь два таких IDT-1 (Iraqi Dual Trainer-1). Спарка вначале имела отдельные фонари для каждой кабины (фото), но после проведенных по заказу командования авиации ВМС Великобритании исследований оба фонаря были соединены специальной вставкой. T.Mk 20 получил также зеркало, установленное над фонарем кабины инструктора - это позволило ему наблюдать за тем, что делает курсант. Также с машины сняли две пушки. 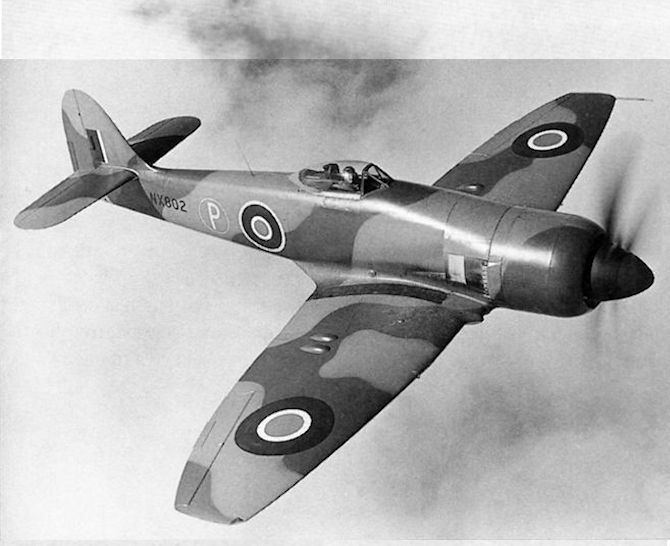 Двухместный учебный Sea Fury изначально создавался для Ирака, но были поставлены лишь два таких IDT-1 (Iraqi Dual Trainer-1). Спарка вначале имела отдельные фонари для каждой кабины, но после проведенных по заказу командования авиации ВМС Великобритании исследований оба фонаря были соединены специальной вставкой. T.Mk 20 (фото) получил также зеркало, установленное над фонарем кабины инструктора - это позволило ему наблюдать за тем, что делает курсант. Также с машины сняли две пушки. 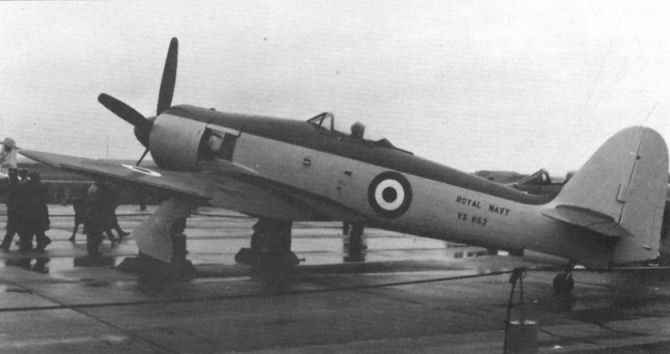 The first Hawker Sea Fury T.20, VX818, after the connecting transparent tunnel had been added between the two canopies. This Pakistan Air Force Fury Trainer K852 is seen at Hawker’s Langley aerodrome before delivery to Pakistan. Первый двухместный "Си Фьюри" T.20 (VX 818). Sea Fury T.Mk 20 prototype VX818, photographed in January 1948. 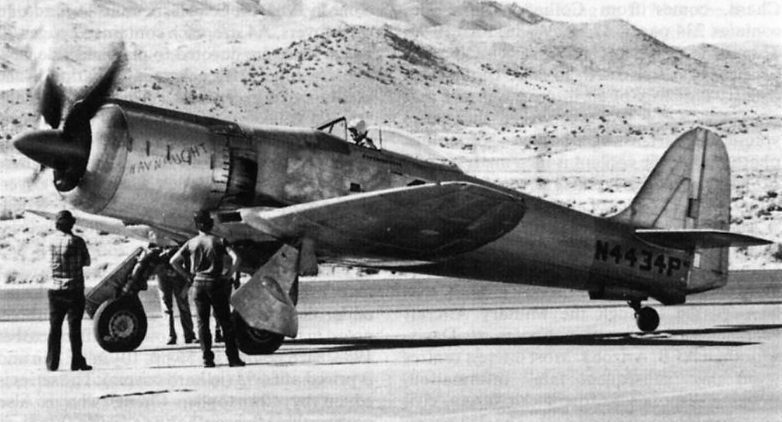 An ex-Iraqi Sea Fury, this variant first flew on January 15, 1948. Note the strut-mounted periscope viewer and the absence of an arrester hook. 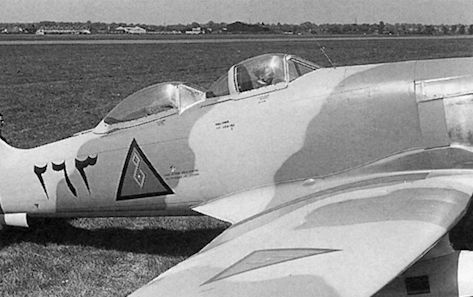 Sixty production T.20s were built, and all were land-based and devoid of arrester hooks. The powerplant was a 2,480 h.p. Bristol Centaurus 18. Прототип учебно-тренировочного Sea Fury T.Mk 20 оснащен хорошо заметным телескопическим прицелом инструктора, установленным между кабинами. This crop-spraying Cessna Model 180 (VH-BQD) is owned by Hazelton Air Charter & Taxi Service of Toogong, N.S.W. 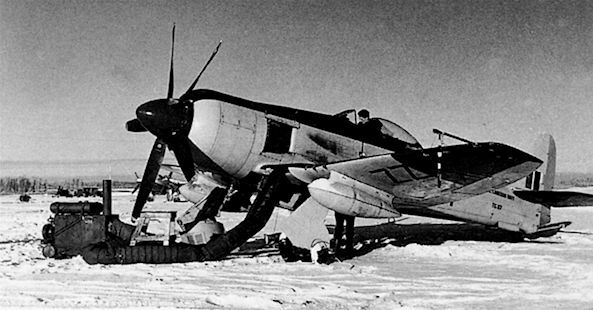 Note strut-mounted rotary brushes and underwing tanks. In the background are Sea Furies and Fireflies.